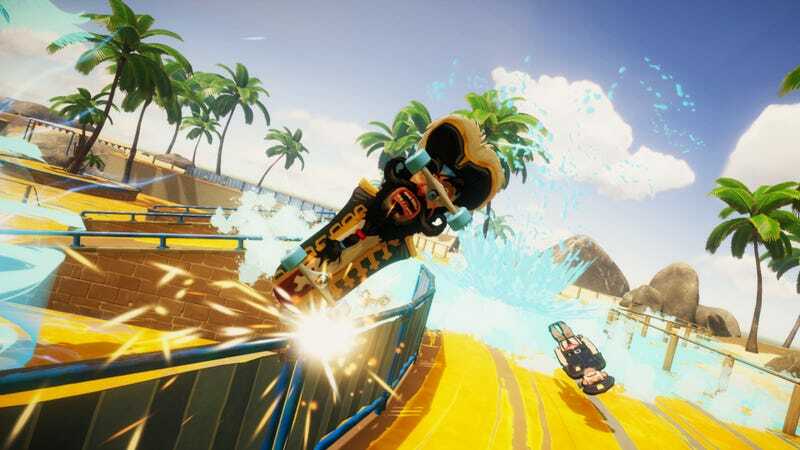 Surgeon Simulator developer Bossa describes the upcoming free week for its new game, Decksplash, as a “first of its kind” experiment. If 100,000 people play it during that timespan, the studio says it will release the Splatoon-but-with-skateboards competitive game into Early Access. And if not? It gets the axe. One part high-stakes gamble, one part promotional stunt, it’s a bold way to test the waters. I reached out to Bossa to find out why the developer decided to take this route rather than releasing the game, which it’s already invested significant time into, in a more traditional fashion. Co-founder Henrique Olifiers explained that the decision is a response to the uncertainty that comes with creating and maintaining multiplayer communities in 2017. So basically, better to find out now that things might not work out than to set sail on a raft of hopes and dreams, only to get eaten by sharks in a few months. In a post on Steam, the studio added that it could just release the game to make a quick buck, but again, it doesn’t want to risk kicking a dedicated community to the curb if the game doesn’t get a bigger reception. Bossa is obviously very hopeful that everything will go according to plan, but six months of weekly play sessions hosted via the game’s website and social channels have left room for doubt. The people who join them, Olifiers explained, have a good time and generally return for future sessions. Beyond that, though, the game hasn’t caught on in the way Bossa hoped it would. The idea, then, is to make the process of obtaining the game as hassle-free as possible to find out if players “genuinely” like it. If they do, great. Decksplash development continues full-speed ahead and probably does a cool kick-flip or something. If not, well, the team at Bossa knows when to cut their losses. The free week kicks off on November 2.